We asked our Fearless members to show and share some behind-the-scenes stories about their one favorite wedding photo. GABRIEL: It was very hard to make this photo. There was a hole in the ceiling at 30 meters high. While the guests were leaving, I asked the bride if there was still time to make one more photo. She gave me 5 minutes which ultimately became 15 minutes :) I was leaning all the way over the hole to make this shot while my assistant held my sweater so I didn't fall down. My hands where shaking and my heart was pounding. I remember giving directions with the loudest voice I could, while at the same time making sure that my camera didn't slip out of my hands because of all the sweat. Yes, I'm also afraid of height. But it was all worth it. 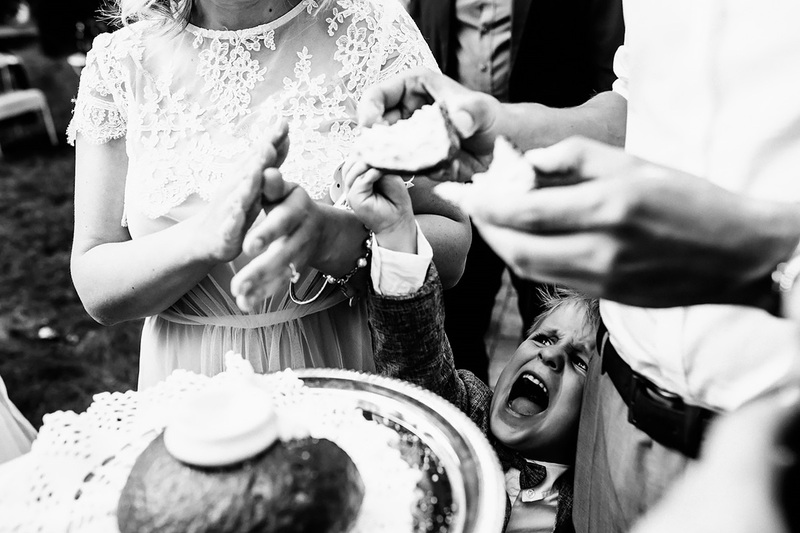 Gabriel Scharis is a professional wedding photographer in Amsterdam. LAURENTIU: I love funny moments, funny people, happy times. Because every wedding is a special one. People are having fun around you, and you feel that positive vibe. There are moments when you capture moments like in this image. It's real, an unpremeditated situation. Laurentiu Nica is a professional wedding photographer in Craiova, Romania. DAVE: These two love each other, and wanted a balance of art and documentary photography. I often struggled to balance the two together, but this wedding in particular was where it seemed to 'click' for the first time. I'm so proud of this image because I don't think I can think of a couple that deserved to have a portrait that I felt as strong on as these two did and it makes me smile knowing that I did my best for them. Dave Shay is a professional wedding photographer in Chapel Hill, USA. ANDREI: This photo is my favorite because It was done when I was on first year on the road in the photo and because I'm aware that it's a moment with i'm not meet again and because it is make with the backup camera. Andrei Via is a professional wedding photographer in Suceava, Romania. ROSA: The last years haven't been easy. I have been through a lot of personal changes and loss of people. I think this is why this photo is so important to me. For me it stands for being loved, held and protected by your parents. It stands for being guided for being allowed to look up and being a child. I know it's a pretty melancholic thought but for me photography is all about keeping the good moments for bad times. We all have to go through hard times sometimes, every marriage will go through a crisis one day, we all have to deal with loss. That's when our photos become so very important. I hope the little girl in the photo will never forget how much she was loved and held. And if my photo will help her to remember this feelings one day, if it will give her hope and connection to the people she loves, I would be so very happy. Rosa Engel is a professional wedding photographer in Cologne, Germany. ROHAN: I call it the organized chaos! Wedding ceremonies are chaotic but at the same time, they allow us to think out of the box and create something totally different and unique. Shooting from the top gave me a whole new perspective to capture the wedding ceremony in a unique manner. P.S. I used my height (6'2") as an advantage to achieve this shot handheld! 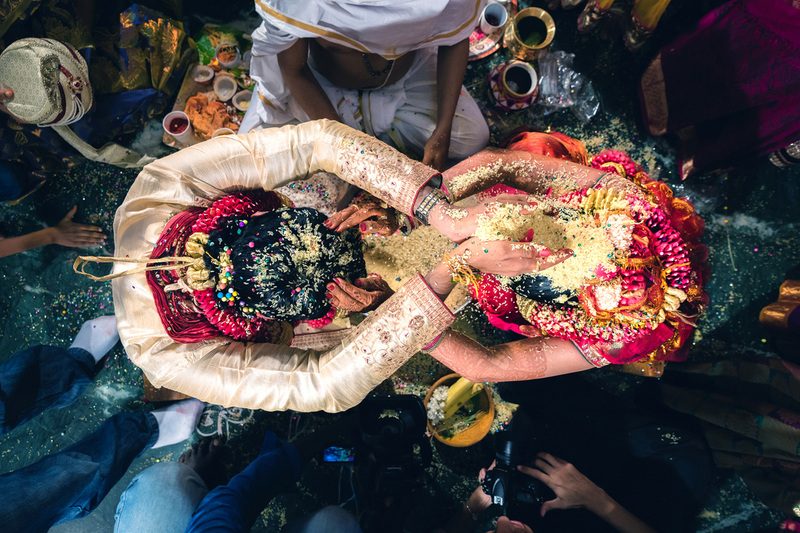 Rohan Mishra is a professional wedding photographer in Chennai, India. MATTEO: This photograph made me rediscover the love I feel for my work. Tell a story with photographs. His grandmother was ill and could not go to the niece's wedding. As soon as the bride entered the room and approached I immediately felt the strong bond that bound them. The bride greeted her, approached her and told her sweet words that I will keep forever inside of me. I do not deny that I cried a lot too. 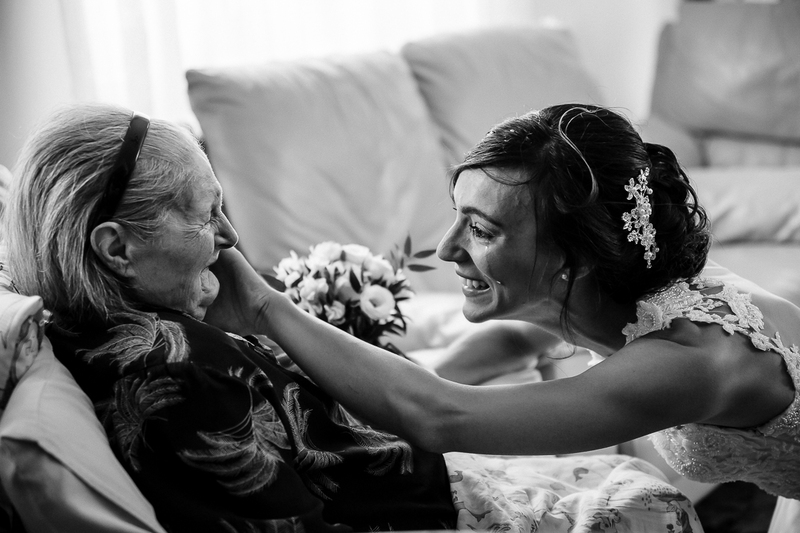 Matteo Carta is a professional wedding photographer in Sardinia, Italy. DIANA: It was a tiny wedding among the closest people! The couple was from Germany. They met seven years ago, but got married only this summer! They have a little son--he is in this photo. The whole wedding day he screamed and ran everywhere, and even broke a glass vase! But the moment shown in this photo is very spontaneous. I noticed it only when I started to edit, and this is one of my favorite wedding cards! Diana Bondars is a professional wedding photographer in Latvia. DUY: I've met Anna & Hans a couple month prior to the wedding. It was little bit of a last minute wedding. She proposed to him in Bali. A day before the proposal she even called up his mother to ask her for his hand. During the meeting she said she wanted a beach wedding. Everyone barefooted and playing games outside and enjoy the beach life. She's a real yogi and he's a climber. Love traveling and being outdoors. At their wedding September 8th, 2017 it was raining cats and dogs. 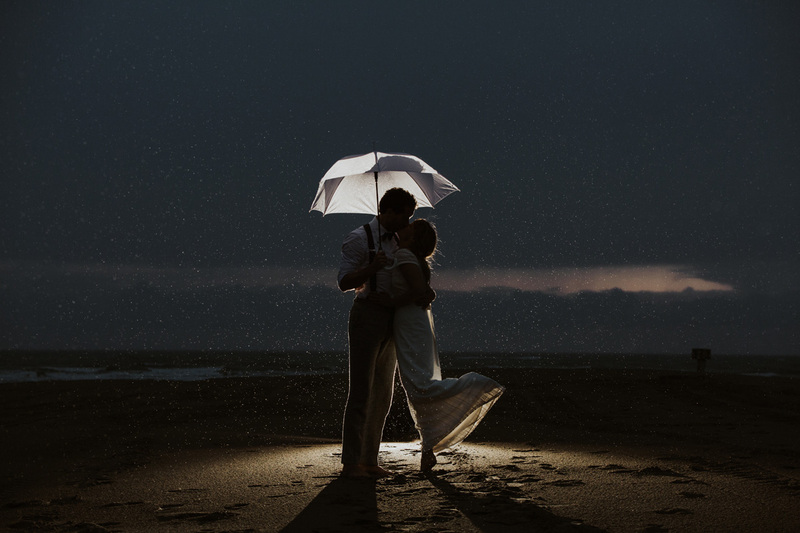 The rainiest day of the year in the Netherlands.She dreamed of a beach wedding, but everything was inside at the beachclub. Personally it was the most beautiful wedding I've done. There was so much love between the couple and all the family and friends. Nothing else mattered. We didn't had the possibility the do a shoot outdoors. I even wanted to propose to do a separate shoot without any extra costs on a other day, because I was so bummed. They didn't care though and they had the best time of their life. I was about to pack my stuff and go home, but I wanted to take one shot outside. Asked them if they want to go stand outside in the rain for one shot. They didn't hesitate and just went for it. Shot this, gave them a big hug and went home. Duy vu Dinh is a professional wedding photographer in Rotterdam, Netherlands. MANOS: This photo is my favorite of all time, because of the placement of everything in the frame along with the importance of the moment! It was taken in Kythnos, a Greek island. I was waiting along with the groom and the guests on a hill at the church. 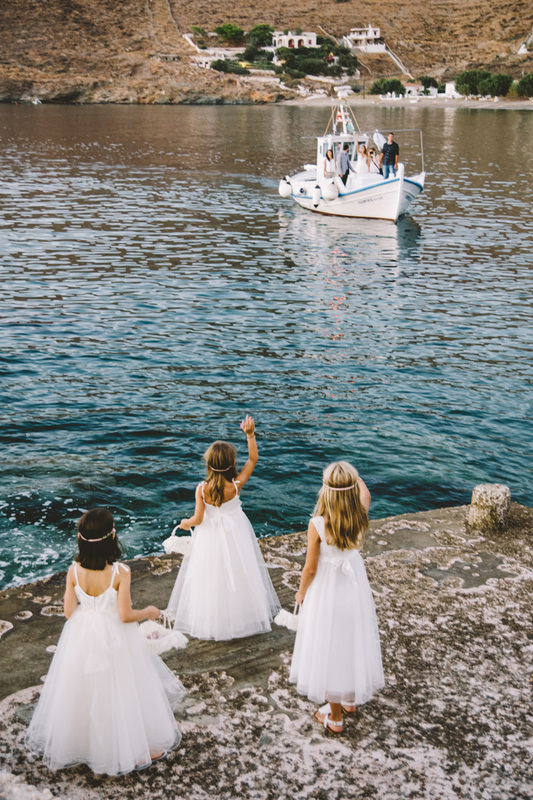 On the bottom of it there was a small jetty where the father of the bride along with these three little brides maids where waiting for her- she was on the boat. I framed and waited for the moment that the father would be out of the picture, everything was in place, the 3 little girls forming a triangle and the boat on their right. At that very moment one of the girls also waved her hand at the bride! 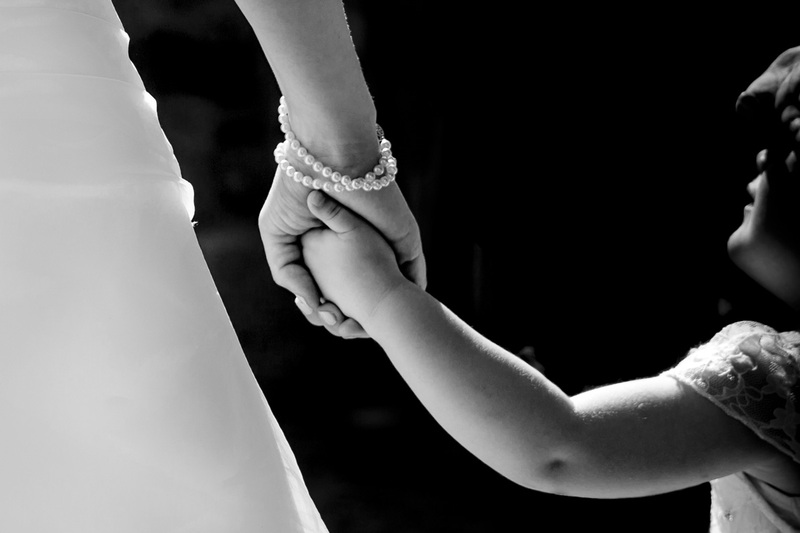 Manos Skoularikos is a professional wedding photographer in Athens. Members, show us your favorite wedding photo!